(CNN) -- A 3-year-old boy who wandered away from his home in rural southeastern Missouri was found Wednesday after a two-day search for him. Joshua Childers was found OK on Wednesday after wandering away from his family's home in rural Missouri. A volunteer combing through Mark Twain National Forest heard crying and found Joshua Childers nearly three miles from his home, authorities said. "Now all he wants is milk and hot dogs," Adam Childers, the boy's father, told CNN affiliate KMOV. Police said Childers was wearing a T-shirt and diaper when he left his home. 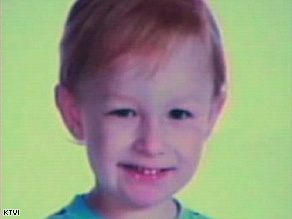 Childers wandered away while his father was asleep and his mother was on the telephone, police said. It was not the first time that Childers had slipped away. At least one other time, his parents were able to catch him before he got into the woods. "I wasn't losing hope. But in my opinion, on a child that size ... I thought three days was a good window," Madison County, Missouri, Sheriff David Lewis told CNN affiliate KTVI. Authorities and an army of volunteers combed the woods on horseback and ATVs to find Childers. On Tuesday, the boy's shoe was found nearly a mile from his home just outside the town of Arcadia, about 100 miles southwest of St. Louis. Mark Twain National Forest is known for its hills, cliffs and creeks. It is also known for its thousands of caves and black bears. "It is really rough country. This is a miracle -- a miracle of people working together," Madison County, Missouri, Sheriff David Lewis told CNN television affiliate KFVS. "I don't know how he did it," Adam Childers said. "I don't know grown men who could do it. He is one tough booger. I will put him up for the Grizzly Adams award. I'm gonna send him bear hunting with a stick."